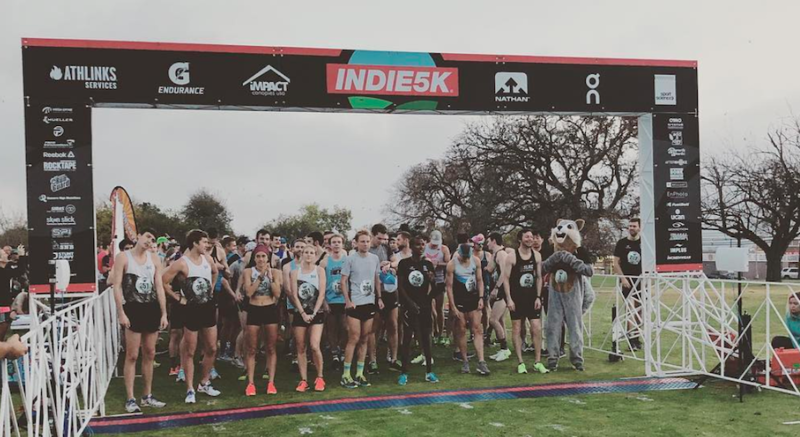 With a spurt of innovation, a healthy shake-out of stores, and a number of nimble adjustments to the changing retail landscape, run specialty is back in growth mode, according to participants at last week’s The Running Event in Austin. 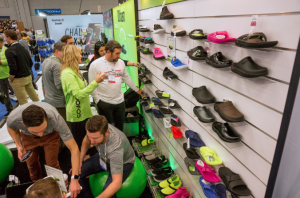 Terry Schalow, executive director at the Running Industry Association (RIA), the nonprofit trade group representing independently owned running retailers and the brands they sell, estimates that the industry is generating low-to-mid single digit growth. That’s below the high-to-low double rates seen earlier in the decade but marked improvement over the generally flat levels seen over the past couple of years, including declines for many specialty doors. The pick-up is evident in SSI Data that arrived last week showing that performance running footwear sales ran up more than 7 percent in the run specialty channel in the 52-weeks through November 24 with growth accelerating over the last two months. Among core brands, Brooks and New Balance are finding double-digit growth in the channel while newer brands, including On, Altra, 361 Degrees and Topo Athletic, are gaining traction and providing a boost. Another sign of recovery was the return to healthy double-digit growth by Brooks, the leading footwear brand in the run specialty space. In October, Brooks reported a whopping 29-percent increase in global revenue in the first nine months of this year, driven by a 32-percent hike in footwear sales. But the improvement was also heard from many attendees at TRE. Among the factors seen driving the sales pick-up are innovation arriving in the footwear space; a shake out that reduced the level of competition across several markets; efforts to enforce MAP pricing and tighten distribution to offset online pressures, and data showing a pick-up in running participation, particularly at the core runner level. Monahan said many stores have figured out how to get even more involved with their local communities. Both vendors and shops have also collaborated to thwart some of the pricing pressures caused by online selling, particularly through Amazon and other online marketplaces. Many brands’ stepped-up investments around MAP (minimum acceptable price) policies seem to be working better. Some are taking other steps to control online distribution. Oofos, the recovery sandal, for example, shifted to selling through its own store on Amazon after facing pricing issues previously. Oofos’ co-founder and CEO Lou Panaccione said Oofos sells online because some consumers know the brand and only want to re-order a pair. But Panaccione said the brand needed better control over prices online to make sure its run specialty partners weren’t being undercut. Run specialty is seen as primary way customers learn about Oofos’ recovery and injury prevention benefits. Indeed, while improving, the industry continues to be challenged managing online pressures as well as vendor’s direct-to-consumer (DTC) ambitions. One running store owner noted that a customer showed him a colorway on Nike.com on her mobile phone at his store and asked if he could order it for her. He found out the color wasn’t accessible to dealers. Several of the sessions at TRE focused on digital engagement. Schalow said omni-channel solutions providers such as Locally and Exchange Collective are arriving to enable brands to support specialty retailer sales. Conversely, specialty retailers end up supporting their loyal vendors when customers are seeking product online. At the store level, stores are benefiting from a greater effort around “curation,” Schalow said. While the term is typically associated with art galleries and museums, it’s the same focus of “creating the visitor experience” for run shops. Schalow believes in-store curation includes a wide range of elements such as the dressing room experience, the payment process on down to follow-up but a core focus is merchandising. In footwear, newness is coming in the form of innovation from a few core brands, including Nike coming out with three cushioning platforms, as well as a newer brands such as Hoka One One becoming bigger drivers. At Brooks, the gains in the nine months were led by franchise icons, the Ghost and Adrenaline GTS but also a healthy reception to new models. This month, Brooks brought some innovation to the stability category with the introduction of the Adrenaline GTS 19, featuring a new DNA LOFT foam as well as updated GuideRails support system. The GuideRails foster stability at the most injury-prone part of a runner’s body, the knee. Some slips by a few leading brands, Asics, Mizuno and Saucony, are said to be opening up space on shoe walls for newcomers. But run specialty stores are also said to be seeking out smaller brands because they’re bringing newness to their stores and more limited in distribution. He believes the industry has become more open to newer and emerging brands than it has been historically to support differentiation and that’s helping Topo secure new doors. Post further said that while the better stores are figuring out ways to get a stronger presence online, the in-store experience remains the backbone of run specialty. Kevin Hanson, co-owner with his brother, Keith, of Hansons Running Shop, with four stores in the Metro Detroit area, believes that while the industry has benefited from improved MAP policies, the in-store experience is making a comeback. While purchasing online is convenient, some runners miss the service aspect found at the store level. Hanson likewise believes consumers miss the “one-on-one conversations” they used to have more regularly at their local grocer. But he believes offering runners a place to try on merchandise, gain advice from staff and particularly get involved with their community socially makes the local running store stand out from the online experience. 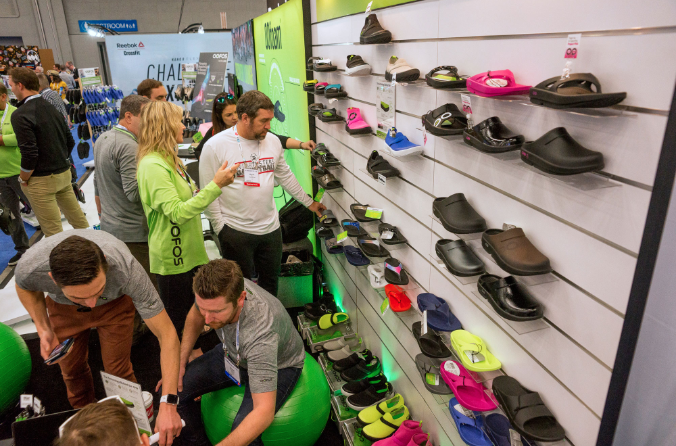 Amphipod’s CEO and co-founder June Angus, in the same vein believes run specialty stores are increasingly seeking out brands across categories dedicated to run specialty. Sneak peek! 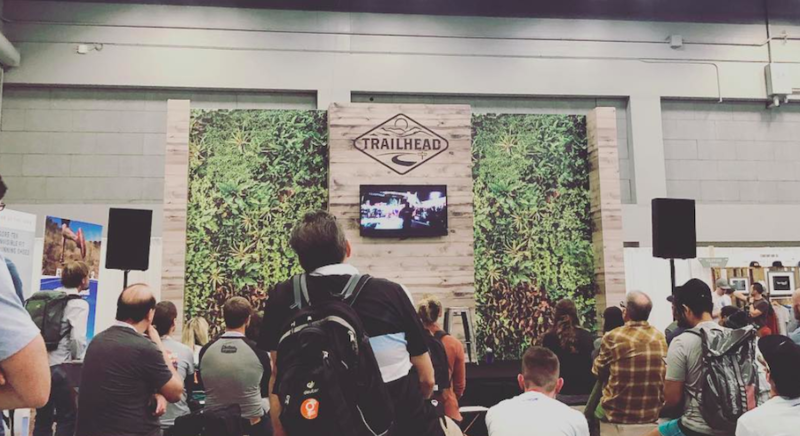 The #TRE18 exhibit hall is looking GOOD! Are you ready?! Russell Nadel, head of core running, specialty and partnerships at Jaybird, the maker of wireless earphones for runners, said Jaybird has gained traction in the space because of its sound quality, fit and durability (sweat and water proof). He also believes more running stores are understanding the importance of earbuds to women as 80 percent have been found to enjoy hearing music or spoken word when they run. Playmakers’ Jones said the industry has clearly benefited from the revival of Brooks and he also noted that Diadora clearly has some buzz although Playmakers hasn’t picked up the Italian brand yet. At his store, Hoka and Altra are doing well as well as New Balance. 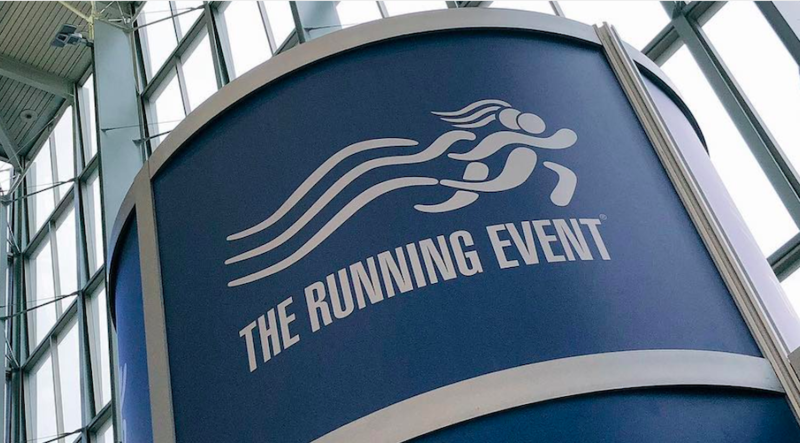 Overall, The Running Event was well attended with some noting that the show’s new owner, Diversified Communications, an experienced trade show operator, added a higher level of professionalism to the event. 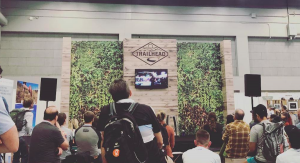 Some of the newer elements included a “Trailhead at TRE” corner featuring athletes and other experts exploring the trail running opportunity, a Sportstyle Select area teaching proper fitting and merchandising techniques; and a parade of social media influencers touring the show on the last day. Race directors were also invited to the show for the first time. But the show didn’t significantly change and Bill Springer, EVP Diversified Communications, said the company is planning to slowly test and introduce changes. He noted that the privately-held firm doesn’t have to pressures to grow like some publicly-held event producers. The industry next year will get another event to talk shop when RIA launches its first working event, called the RIA Kick Show. The event, to be held in Denver in June 2019, won’t have an expo and will focus on best practices, according to Schalow. Schalow believes a large part of the run specialty’s bounce back is because running shops have embraced a significantly higher level of sophistication from an operational perspective, including not only merchandising but staffing, training, marketing, leasing and other areas.